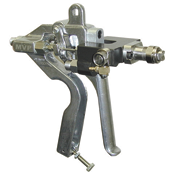 MVP’s Cipher Guns represent a breakthrough in ergonomics, simplicity and emissions reduction. Lighter than the competition, the Cipher Gun is the first truly operator friendly guns. Dissassembly for cleaning and maintenance, is easy with the modular rapid access design (R.A.D.). The push button flush system allows material to flow directly through the resin port so no residual resin is left to gel overnight. Fewer parts and simplicity of design create easier maintenance and less downtime. With fewer parts, the Cipher Gun is over a pound lighter than the competition. The reduced gun head weight, balanced design handle and trigger, puts the weight of the gun further back over the hand for a distinct ergonomic difference. The MVP Cipher Gun incorporate a “Rapid Access” head design. With fewer parts and simplicity of design, replacements take only minutes. Utilizing the patented FIT, the Cipher Gun has less over-spray, easier clean-up and lowest emissions on the market. This results in a significant material savings, and government EPA conformance.